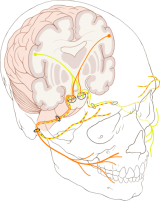 The Facial Nerve is the seventh Cranial Nerve. It is composed of approximately 10,000 neurons, 7,000 of which are myelinated and innervate the muscles of facial expression. The remaining 3,000 fibres are somatosensory and secretomotor, and are known as the Nervus Intermedius. Smile, close eyes, pucker lips, wrinkle nose, raise eyebrows, frown. The nerve lies below the pons, lateral to the abducens nerve, medial to the vesibulococholear nerve. The facial nerve and the nervus intermedius pass through the cerebellopontine angle to the internal acoustic meatus. The facial nerve and nervos intermedius lie in the upper quadrant, and pass through the internal acoustic meatus. Here the facial nerve lies immediately below the lateral semicircular canal in the medial wall of the middle ear. It passes behind the cocholeariform orocess and oval window. As the nerve exits the stylomastoid foramen it gives off a sensory branch to part of the external acoustic meatus & tympanic membrane. It then passes between the stylohyoid and digastric muscle and enters the parotid gland, where it lies between the deep and superficial lobes of the gland. Here it divides into two main branches (at the pes asnerinus): superior temporofacial and inferior cervicofacial branches. There is another detailed diagram of the course of the Facial Nerve on the Facial Palsy page. The facial nerve innervates 14 of the 17 paired muscle groups of the face on their deep side. 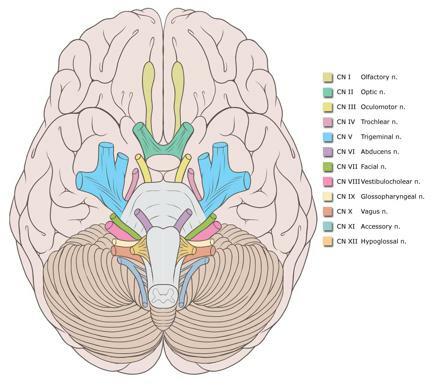 The 3 facial muscles are innervated from other sources: buccinator, levator anguli oris, and mentalis. The cervical division provides platysma innervation. The facial nerve (along with the acoustic nerve, CN 8) arises from the fascioacoustic primordium which forms by the 3rd week of gestation. The geniculate ganglion, greater superficial petrosalnerve and nervus intermedius are all visible by the 5th week of gestation. The 2nd branchial arch gives rise to the muuscles of facial expression in the 7th & 8th weeks. By the 11th week the facial nerve has developed its branches. In the newborn baby the facial nerve anatomy is the same as that of an adult, with the exception of its location in the mastoid, which is more superficial in the baby. Computed tomography (CT) scanning and magnetic resonance imaging (MRI) are useful in the diagnosis of injury to intratemporal and/or intracranial affections of the facial nerve, as they may reveal temporal fracture patterns (vertical, transversal, mixed) and oedema formation. Under certain circumstances, the facial nerve can be viewed, and swelling or disruption may be seen. Perioperative Care Considerations and Management of Complications Involving Surgical and Technology Procedures. Stimulation or lesion of the medial vestibular nucleus increases the number of choline acetyltransferase-positive efferent vestibular neurons in the brainstem. ↑ May M, Schaitkin B. May M, Schaitkin B, eds. The Facial Nerve, 2nd Edition. New York, NY: Thieme; 2000. ↑ Davis RA, Anson BJ, Budinger JM, et al. Surgical anatomy of the facial nerve and the parotid gland based on a study of 350 cervicofacial halves. Surg Gynecol Obstet. 1956;102:358.